Welcome to the second installment in a four-part series about batteries for stand-alone power systems (SAPS) otherwise known as ˜off-grid’ power systems. Previously, we wrote a rather technical but practical entry about how to size a battery bank based on your household energy consumption and reliance or non-reliance on other power sources, such as generators. This shorter, less technical entry will focus on the various types of batteries that are available and typically used in off-grid systems. Not just any random battery will serve an off-grid system as equally well as another. Individual SAPS batteries can be similar and size and weight to the type of battery you use to start your car or boat engine. However, their design and purpose is significantly different, so if you are for some reason attempting to piece together a system from old car batteries, be warned that you are setting yourself up for trouble! A special type of battery called a ˜deep-cycle battery’ is the standard for SAPS. A deep-cycle battery is designed to be discharged during its use to a certain percentage (usually up to 80%) of its full capacity (or its ˜depth-of-discharge’”see the previous article linked above) and then recharged repeatedly. Why does this happen? Well, it has to do with the way that batteries work and the materials that they are composed of. Batteries store energy in chemical bonds and release it by breaking them. Batteries that can be recharged, like the ones in SAPS, are known as ˜secondary’ batteries, as opposed to ˜primary’ batteries, in which the chemical energy-release process can in effect only happen once. The most common medium for this type of energy storage is the good old flooded lead-acid battery or wet-cell battery, the cheapest way to keep energy contained and transportable since its invention about 150 years ago. As an alternative to wet-cell batteries, it is possible to use valve-regulated lead-acid batteries. The differences between these types are discussed below. If you get an off-grid system, your batteries will likely be lead-acid batteries, so we’ll spend the most time talking about these. The following sections apply for both flooded lead-acid batteries as well as the ˜valve-regulated lead acid’ variety. All types of lead-acid batteries, including flooded lead-acid batteries, work on essentially the same principle. There are three main components: an anode (positive electrode), a cathode (negative electrode), and an electrolyte, which is the substance between the two that acts as the energy-storage medium (see picture). 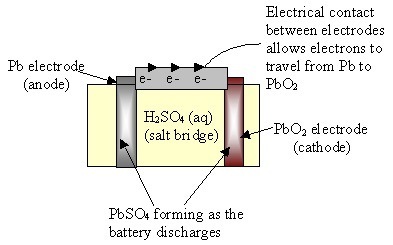 When the battery is charged, the electrodes (composed of elemental lead and lead oxide) sit in a sulfuric acid electrolyte. As the battery is discharged, the sulfuric acid binds with the electrodes, so that the electrolyte becomes mostly water (thereby leaving it susceptible to all the things that water is usually susceptible to, i.e. freezing and evaporation”especially in ˜wet’ flooded lead-acid batteries, but we’ll talk about battery maintenance further in the next installment in this series.) As the charge/recharge cycle is repeated, the chemical reaction happens less and less efficiently, and eventually the battery will become difficult or impossible to charge, at which point it may be pronounced ˜dead’. Circumstances differ depending on battery maker and brand, but in general it is safe to say that, no matter the brand, deep discharges are bad for lead-acid batteries, and battery life is best preserved by keeping your batteries as topped-up as practical and possible, charge-wise, although overcharging is also a danger. The standard measurement for battery life is the number of ˜cycles’ it can be expected to go through before becoming unable to hold a significant charge any longer, usually less than 70% it’s original capacity. What a ˜full cycle’ consists of depends on how the battery is rated”with some batteries a cycle could be as deep as 80%, or as shallow as 20%, but is generally recommended at 70% for SAPS. Your batteries will ˜live’ longer than the officially advised lifetime, however, if you don’t regularly hit your maximum depth of discharge, i.e. if you oversize your battery bank capacity relative to your expected power consumption. How quickly you reach what depth of discharge will depend on your battery’s C-rating (see previous blog post about batteries) and what the average current being drawn from your bank is. Of course, it won’t be very economical financially or space-wise to super-oversize your battery bank for the simple purpose of reducing your depth of discharge; if your battery bank is chosen and operated wisely, you should get at least 5 to 10 years use out of it, possibly longer. -The two types of valve regulated lead-acid batteries are ˜absorbed glass mat’ (AGM) and gel types. In both types, the electrolyte is enclosed and does not require manual topping-off as with wet-cell batteries, and they are therefore often referred to as ˜maintenance-free’. In AGM batteries the electrolyte is trapped between layered lead-calcium plates or coils. In addition to their not requiring maintenance, these batteries are purported to have longer life-spans than traditional wet-cell batteries. Gel-cell batteries, on the other hand, are just that”the electrolyte is a gel, and in addition to being maintenance-free, they are very robust, having a higher tolerance to being knocked-about than wet-cell batteries, which must be kept upright. However, there are limitations to the charging current that can be used with these batteries, and care must be taken not to overcharge them. In addition, because of their ˜closed’ nature, it is not possible to easily undertake maintenance, and their life-spans tend to be shorter than AGM or wet-cell batteries. You may also see batteries that are not lead-acid types. These are much less common and the prices (both for purchase and disposal) can be prohibitive, although their life-spans are much longer and it is possible to discharge them to greater depths with little or no negative consequences for the battery life”essentially, there is a much higher limit on the number of cycles, and deep discharges do not affect battery life as negatively as with lead-acid. NiCd (Nickel-Cadmium) batteries are one such battery, frequently found in shops as small-scale rechargeable batteries for small household appliances. However, the high price of cadmium makes these batteries much less economical on a large scale such as that required in a SAPS battery bank. Vanadium red-ox and zinc-bromine batteries are two technologies that are occasionally used with SAPS, and both have the advantage of being capable of many more cycles and therefore longer life-span than traditional lead-acid batteries. However, here again cost and availability often make them more expensive. In the next entry, part 3 of 4 in this series, we will look at what is involved in lead-acid battery maintenance. ps. Your blogs have been very helpful…..thanks. Thanks for the comment. The major downside to Lithium-ion batteries is their price, although this is steadily coming down. Lead-acid are the industry stand-by at the moment, and tend to be the most cost-effective option. Good luck with your place! Hi,I’m trying to source 12 by 2volt gel cell deep cycle batteries for my remote power system,around 1000 to 3000 ah. Thanks for your inquiry. Please give us a call on 1300 78 72 73 or fill out a request for a free quote comparison here. We’ll try to help you out as best we can.